Multiplication and the Importance of Types (math-teach at Math Forum). By "logic with types" I simply mean a computer language mirroring mathematical objects already in the pantheon: types of number, polynomials, vectors, matrices... things that add and maybe multiply. What I'm suggesting in (a) is that we encourage more philosophers to look over the hedge into the computer science neighborhood, where we suffer from logjams and stalled stories, at a cost to Global U students everywhere. Our curriculum is in a shambles. Here we are in 2010, with stronger than ever 3D projection techniques, and yet spatial geometry is still in the dumpster. Thanks to "duck typing" I'm prone to blame quacks, but that's a pretty generic response to a dire situation. We should get more focused. About as clear as it gets, when it comes to encapsulating an approach, spelling out the whys and wherefores... Note the last section is a not-so-veiled allusion to the synergetics concentric hierarchy. No kite this time, but you might imagine one as two sytes, somewhere on the menu. We're enjoying a steely gray day in Portland, with lots of cold rain. A neighborhood representative came by with the Richmond newsletter and we discussed gardening strategies. The truth about Portland is it's hard to go wrong, and people try many things, most of which work, in one way or another. Alexia zipped through to use wifi between appointments. Glenn and I are on tap through Free School, as teachers of Neolithic and Martian math respectively. The control room collective acts as a dispatcher, books venues, like on SE Belmont or wherever. Our next gig is in March. Sometimes Italian hill towns, tired of internal feuding, would outsource the mayor position to someone with a recognized track record. The crack team would come in, set up housekeeping, and maybe show the locals how it's done. Before long, the town would be running smoothly again, simmering issues resolved, hard questions confronted. If the temporary managers saw themselves in that light, as temporary, not looking for permanent work, then the workflow would go smoothly. However, some might see themselves as wanting to become entrenched, to go for that pension. In exceptional cases, this might be a welcome development, to have an outsider join the community in some responsible capacity, but for the most part, your outsourced team should move on, as the locals will eventually wish to reassert their steering functions, now that they've learned how to drive in a new way. This same issue arises with mercenaries, ostensibly hired to protect against foes in neighboring hill towns. A corrupt force, taking money from all sides, selling services to all sides, will simply run it as a protection racket. In a monopolistic economy, that spells trouble for all concerned. in business, we speak of B2C vs. B2B. That's business to consumer and business to business. I think of teacher trainings as B2B. Imagine Intel a sponsor, and teachers getting paid to be there (on the clock, serving the public). In the balance of this post, I'm giving examples of the kind of lore each teacher might adapt, translate, recast in terms relevant to those placed in her or his care. The teacher manages the classroom, and the curriculum deliberately encourages a place based approach: embed this material in local circumstances in ways that will help your students gain mastery over their own environment. 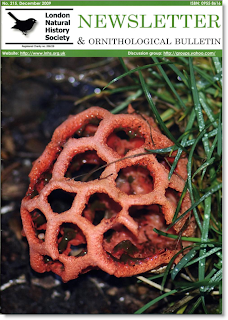 the emergence of 60-degree coordination (in contrast to XYZ) in connection with the discovery of the hexane ring, newly popular drawings of naturally occuring shapes. Would a child in Borneo have any interest in such stories? She or he might well. UN agencies, many school districts, some curriculum providers, prefer this "place based" approach. The geographic component gets a boost. Math becomes more of an outdoor activity as navigating the subway and bus system becomes an exercise in topology or graph theory. Counting calories in an energy conserving context is not off topic either, as foods and food values have their own calculus, worth learning. Calories connect to kilowatt-hours, other measures of energy. Conversion constants apply. In some parts of Oregon, there's a trend towards schools having their own gardens, even in urban settings. This is par for the course in many parts of the world. Having "the field" be a gridiron and practice space for mostly physically dominant boys is likewise commonplace. I've seen many schools with ample room for both a field and a garden. In some of these same schools girls share access to sports facilities as equal partners, with varying degrees of segregation. Entirely segregated schools may be publicly chartered in your zip code area. Language immersion schools may also be provided, with or without segregation. Once you start getting into permutations, no one district may be expected to cover every possibility. An active exchange program will give your family access to other options, including overseas. The math problem at Peoples' Food Co-op was to figure out which eco-friendly dish washing powder soap had the most bang for the buck. The bulk offering said 3x concentrated, only a table spoon per load if your unit had but the one soap holder. The two boxed offerings gave weights, but only one gave loads per box. The other had temporarily removed the word "natural" from its literature and wanted readers to know why. My challenge was to use my cell phone as a calculator. This isn't one of those Droids or anything, not R2D2. I flubbed getting a decimal point, plus still needed to ask how much of the bulk item gets one those 64 loads. Lindsey, much better at this game, volunteered to obtain this information next time, was just too busy buying to feed her army, at the time of my flailing. We were at Peoples' in service of another Vegans not Pigs at Duke's Landing (with chicken an option for carnivores). These have become ritualized no-alcohol events, where we learn how to buy and cook effectively and tastefully, amidst live music provided by local bands. A more wholesome event would be hard to distill. 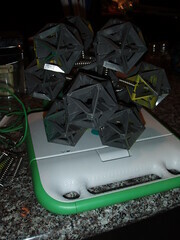 I brought a whole paper bag of Flextegrity icosahedra, cast-offs with paint on 'em, fresh from the Pauling Campus studio. I feel like one of Santa's elves. I piled some around an old XO for another photogenic tableau. Maybe this one 'll end up as a polyethylene billboard in Tokyo somewhere (just kidding)? G1G1 meets Radical Math (polyhedra are considered somewhat radical in 2010, check standard textbooks to gauge the level of our poverty). One imagines these innovative subcultures, working towards a better tomorrow. In Portland, we have them. However it's probably a good thing the Japanese TV crew didn't come all the way from Narita for this one. Troy has to DJ somewhere else tonight. There's not been much publicity to speak of. You won't find any mention of these experiments in The Oregonian or Willamette Week. We'll make do with the amateur film crew (me). Evelyn just showed up, is joining Lindsey in the kitchen upstairs. Now here's one of the bands. My daughter is off at her debating tournament all day, is welcome to join us (too exhausted: "extem" with 30 minutes to prepare on any subject, no Internet, is a rough row to hoe). Now that Pycon is gathered in Atlanta, we're getting some themes coming through on the PSF members list. If you scrounge around in the blogosphere, you'll likely glean more. I spent another long day with the math teachers, yakking about my days at McGraw-Hill (Hugh Kenner important, wrote a column for BYTE). We should be seeing those recruiting commercials around now, for our new kind of math course. Fighting about what programming language to use is somewhat beside the point, as that's for teachers on the ground to decide. One goes with the army one's got, as someone once said. Mike D has installed Xtra Ordinary on his XO, an operating system geared more for adults. Yes, there's a counter-culture aspect to these operations, in that we're documenting how Portland's underground was carrying the torch forward. When it comes to tetrahedral mensuration, world game, octet truss, tensegrity, flextegrity, global grid etc., the avant-garde was on SE Belmont, with Laughing Horse and Pauling Campus among the back office collectives. Lets keep this in mind as other institutions crowd in to cash in. I'm seeing all those worries about Iran, but then I'm thinking the diplomatic corps has been amply endowed with all the raw materials necessary to implement confidence building measures. We don't just want better nuclear medicine in Iran, we want a stronger power grid feeding the Middle East, including states with no right to exist (all of them). Don't blame the religions for not getting along, as I think those problems have been mostly resolved. You've got a bunch of weak kneed politicians running around drumming up fears, but that's hardly to work for one's pay. If fear mongering is all you've got, why not just admit to incompetence and gracefully announce retirement? OK, harsh words from the peanut gallery, I admit it. However, the "give peace a chance" meme didn't start with me. Lots of great ideas for geodesic mosques, worth trying, Allah would like it I bet. Many interesting civilizational innovations ahead. To ramp up towards war is definitely anti-Christian, as well as anti-Muslim etc. I wouldn't go running to the corner guru for an excuse. Wallowing in the nuclear weapons world is just poorly thought out. We need to stop proliferating, obviously, but we also need to keep cutting back, decommissioning. It's a long slow process and requires ongoing verification. Iran is neither the first nor the last player at this table, just one more among many. So let's get on with the real work of disarmament, starting with the big powers as usual. Regarding 60-degree coordination, we have this focus on the tetrahedron instead of the cube. In this case you find many published books, some coffee table arty, some on the web, magazine articles, web pages, Youtubes, other scholarship, and *still* it's almost impossible to get the time of day from busy (too busy) people. I'd say it's the Necklace Effect that I'm after, in that the 60-degree aesthetic forms a glue language, a rubric, like a string, with concentric hierarchy, octet truss, Fuller Projection, world game, geodesic domes, high tech eco-villages, healthier lifestyles... mom and apple pie, all beads on that string. Yes, I note the family resemblance to "domino effect", well exploited in the movie Robots. The concentric hierarchy is the best bead to keep nudging, because it's so mathematically correct. Those defending the bastions of rationality tend to close loopholes with hard logic, if any might be found. Or will they try to fake it? Using some flavor of CS BS perhaps? Is this about Computer Science versus Neo-Platonism? Ghosts of Bourbaki? What do the artists say? You'd think the intelligentsia might at least appreciate the marketing challenge. Here's a fun puzzle for you Madison Avenue types. Is this a "too bitter a pill" scenario? What sugar might we coat it with? The eye candy is already tops. Once in, we find the concentric hierarchy is a bastion of rationality in its own right, and worth defending. Then it's on to the adjacent bead, and so on down the line, like firecrackers going off. Some kind of celebration? Kirby Urner: in the calcs below, the assumption is always tetravolumes, meaning we've calibrated to the concentric hierarchy with the volume 20 cuboctahedron. The icosahedron with that same edge, of volume ~18.51 is the icosahedron of volume 5 Φ2 √2 mentioned below. 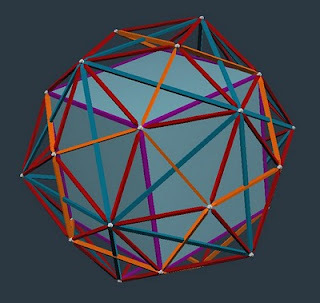 The pentagonal dodecahedron is its partner in the rhombic triacontahedron, inside of which one finds these unit-edge cubes (but not of unit volume in this schema). I was wigging out on Facebook, between praying for Pat and Aunt Betty, Aunt Evelyn, dear friends. Because of this looming ski trip. Who were the adults? Tara was organizing skillfully, but teens deserve role models. I greatly appreciate those stepping up to the plate. I'm less stressed in that dimension. LW is loading the company car for another fundraiser. I'm likely out the door in a different direction, but that's for the future to bring. I checked in with Dr. Tag earlier, walking to and from. She was expecting to overlap with some Mercy Corps staffer, with news from Haiti, insider perspective. I at least conveyed the good news about our green light for the math teachers (talking about those kites at the NCTM website): you're officially free to teach our Renaissance shoptalk, in tandem with standard fare. 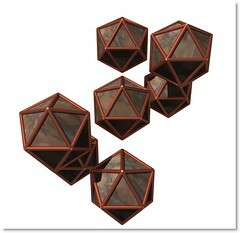 Be generous with those polyhedra, why not? Think geodesic. Spice it up, share the lore, build bridges to other ethnicities. Math is about reaching out, not just introspecting. Philosophy that much more so. Midnight gardening anyone? Sounds kinda kooky I realize, but the front side pile, the result of a welcome thwacking, was just calling out for attention -- of a kind I don't need. So I filled a thistle bin, hauled some twigs (giant ones), moved stuff around. It's not like we're over-staffed or anything. I do what I'm able, as a man of modest skills, still trainable. Thank you to well wishers, co-conspirators, hangers on. Blessed be. I think what's probably obvious to all of us is that the word "textbook" is becoming decoupled from the medium, or was never that coupled in the first place. A textbook has a specific format and purpose. In a math teaching context, a textbook usually comes with exercises, perhaps a teacher's edition and so on (many criteria pertain). Is it a PDF? In wood pulp? On a Kindle? An XO-3? We don't know, just from the word "textbook". In the case of books through Google, the author may have already chosen a public license, so free copying is not an issue. When I teach a "Pythonic math" course (math using Python), I'm free to point students to free textbooks on the web, other writings, and not dictate whether they order printed copy or not. Some may have valid and necessary requirements for hardcopy. I have that myself, in part because some people don't believe a book exists until it weighs something. Sometimes you just want that airplane seat copy, with no need to haul out a fat laptop. The Obama Administration today signaled its interest in Old Man River City as a possible public works project. Community leaders familiar with the design have been invited to the White House to discuss its prospects. Clearing the construction site could begin as early as next year. Sarah Palin acknowledged today that as former Governor of Alaska, she was quite familiar with the Bering Strait high voltage linkup proposal, but thought it needed more study. CNN will be running a series of special features focusing on the global electrical grid, its history and prospects. Google Earth has created a new data overlay showing electrical grid information. The recently implemented fold-out options show the entire Earth in one view. The Fuller Projection is one of several available. The NCTM has officially endorsed "tetrahedral mensuration" as a worthy topic for inclusion in K-12 mathematics curricula, based on results from several pilot studies, and expert advice from key professors. Students in Flint, Michigan will be among the first to test drive the XO3 tablet, the next iteration of the One Laptop per Child line. Company sponsors include a long list of familiar brands, including Kellogg and General Mills. Reality checks: OMR is currently shelved and rarely if ever mentioned; Governor Palin and CNN never mention the Bering Strait electrical hookup (not the same as the Bridge to Nowhere); ESRI ArcGIS 9 includes a Fuller Projection but Google Earth does not; NCTM does do some "non-traditional" tetrahedral mensuration on an obscure web page; it's unclear if the XO3, with more skeptics than sponsors, will be available by 2012 (or produced at all). I'm not planning to analyze the Superbowl, which I saw quite a lot of, not even the commercials. LW was too busy working on her community garden to catch the game, but did confidently predict a Saints win, based on early season previews she'd seen at one of her sports bar music venues. I announced her prediction before the game, injecting a plot element. Speaking of work, I missed most of the half time show, instead went off to a secure area to pace back and forth and call another attender in our Multnomah Friends directory, seeking more feedback on AFSC matters, given all these emails going around. I have some official duties to look after. Did The Who sing Won't Get Fooled Again? Apropos if so. Earlier this afternoon I joined Overseers in slogging through a long agenda. Quakers work hard in their various jobs, take them seriously. These are stressful times for all of us, as we seek to find our way forward. We met in one of the classrooms, the one with the Fuller Projection. The maps on either side have some features in common (a family resemblance): the National Geographic one to the left has no nations, while the older Mercator on the right is more drastically distorted. The Fuller-Sadao projection is North Pole centric, which suits no one's political agenda all that much. This has always been an esoteric map; cool to have Quakers using it some, part of our shared heritage. I encourage high school teachers to use it too. Tell some of the stories behind it why not? What's a projection? Which world maps are the most commonly used? What are their properties? Basic stuff, hard to justify bleeping over, if one takes geography at all seriously. Google Earth and the various map engines get some focus here too, if the school has an Internet connection. The practical matter of getting directions between points A and B, finding one's way about in one's own terrain, is legitimate geographic content and of immediate relevance to teenagers. We call this a "place based" curriculum. Around here, that means studying the Columbia Gorge, it's geological history, the dams, the grid they feed. Yesterday morning I wrote another essay on this phi/sqrt(2) business, bussed it out to some influential contacts. I'm thinking we've got a discovery here, one that's accessible, doesn't take a fancy degree to appreciate. There's an audience for this kind of thing. Yes, a little setup is required, like the shift into tetra-volumes, but then that's easy enough to grok, something we wanted to share about anyway. Then shift back to hexa-volumes, the well explored option, not about to fade out. Should we compare shifting between 60-degree tetrahedra and 90-degree hexahedra to shifting between decimal and hexadecimal bases? Ten is a triangular number (60-degree), sixteen a square one (90-degree). I also put in some positive words for WikiEducator, encouraging its use, given the discussion on edu-sig (Python community) has returned to open source curriculum writing. That's what Wikieducator is all about. The new WYSIWYG editor makes it even more accessible. Getting started is a piece of cake. Master the intricacies as your schedule permits. Does anyone disagree there's a trend here? Academic culture is updating its code of ethics to accommodate self-correcting copying and transmission (tcp/ip). We've been hearing this at conferences for years, so it's not like I'm reporting breaking news. Withholding vital information from needy students simply goes against the grain of a university, religious and/or secularist. Over on math-teach, I've been enthusing about Dr. Chuck's contribution (University of Michigan). He's adapted an open source textbook that's already been through a number of changes. This is how teachers may expect to keep pace. Find some freely available raw materials and add value, engage with your peers. I often tell people I communicate by blogging, but hey, what are cell phones for, if not to make calls during half time? Blogs have limited appeal, as do computers in general. This was not at my place, the private residence where we congregated around an HDTV. Three of us piled into a car to get there. I enjoyed meeting some older guys I'd not met before, including a taxi driver on break in 3rd to 4th quarters, grabbing some coffee and pie, heading back out. On screen now: Metropolis (original version, 1927, Tower of Babel part -- I came in late). Yes, moving imagery has come a long way since those times, but in another sense not so much (the special effects are pretty impressive and intense in this black and white classic, the musical soundtrack just adding to the eeriness). 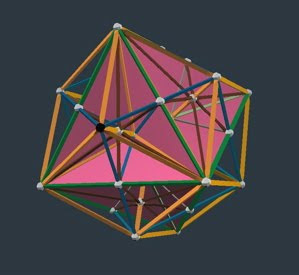 Speaking of tetra-volumes, David Koski has been busily dissecting the four hexahedra that make up the rhombic dodecahedron. The vZomes are pretty clear, although I abet with my cube of magnetic Mites. Three half-couplers do the job, giving each a volume of 3/2. He's getting into the different permutations of As and Bs, a topic at the heart of Synergetics. Maybe I'll follow up on that soon. I appreciate your comments below Allen. The problem here is we're all POWs, prisoners of wars we can't seem to get out of. It's not just a matter of a few people suckered in by video games. Ironically, I think some people in the military are acutely aware of the problem, as they're trained to think about security and there's nothing secure about trashing infrastructure and wasting fuel when the world is in dire need of both. Keith's mega-projects are at least positive and philanthropic. 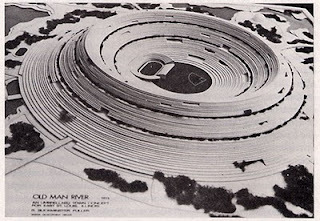 Fuller's idea of Old Man River City was certainly apropos after Katrina, as it was built on the model of a huge sports stadium (domed of course). However, given the investments that were never made, the only recourse was to use actual sports stadiums, a disaster. The stark contrast of where we are, and where we could be if not hell bent on squandering, is what we need to focus on, with an eye towards getting back on track. What it comes down to is investment i.e. where do you put your energy and time. If there's not a positive future vision out there, then people default into fear, fall victim to fear mongering, which fuels investments in those very technologies that further deprive us of hope and options. Where do I put my energy and time? Good question. For what it's worth, I've been collaborating on getting the Synergetics entry more fleshed out on Wikipedia. It was languishing as a stub page, and before that as a footnote to a different Synergetics entry (Haken's). Feedback welcome. I was just having lunch with Arthur Dye, whom I meet with periodically. We caught up from both sides to some degree. Arthur is interested in the homelessness situation, especially along SE Belmont, has been looking in to what Methodists might be doing. I filled him in on how the art community, the musicians specifically, have been responding. Lindsey is out delivering a shipment of camping supplies, UPS delivered to the Laughing Horse collective just recently. Muddy Waters (soon to close) and Duke's Landing are among the dots of light in this network. We went over some of AFSC's recent travails. Arthur's view is the Vietnam Era was so horrific, so unlike anything the agency had hitherto encountered, that it may not have recovered fully, is still crippled. Quakers were picketing their own meetings for refusing to declare Nixon a war criminal. Anecdote: when Richard Nixon was newly out of the army, first running for Congress, his mother Hannah phoned the then director of AFSC and conveyed her concerns, that her son was drinking a lot and had become a warmonger, and could you, Clarence Pickett, come out and talk to the guy. Director Pickett got out there by train (Philadelphia to LA is a long way) and indeed had two days with Nixon. However, shortly thereafter, Pickett died of a heart attack in San Francisco. No one knows much of what transpired during their visit. Thanks to the Laughing Horse connection, I've seen a whole lot more American history, up close and personal in documentary form. Were I a degree-granting institution, I'd give myself one or two, as this has been a crash course and not especially easy to digest. Recent history is still not a mainstream topic, as Colonel Fletcher F. Prouty points out, in connection with the U2 for example. It's easier to fight about Darwinism and global warming, than it is to really look closely at one's own recent past. "Nixon" has been among the examples of proper names going by on the Wittgenstein list, where Sean Wilson has been leading a thread. I chimed in with some stuff about EPCOT. If you're already steeped in this literature, you know that Saul Kripke writes about "Nixon" sometimes (as Google will disclose). In terms of where Quakers might be going, Arthur had brought along a recent story (December 2009): Quaker Indian Committee disavows Doctrine of Discovery affirms Declaration. Said doctrine is a product of the 15th and 16th centuries. The Episcopal House of Bishops had already voted unanimously on their "Repudiate the Doctrine of Discovery" resolution, the House of Delegates likewise repudiating said doctrine by a strong majority, during their 76th General Convention in July. The affirmed declaration (in the story's title) is the UN's on human rights. The Parliament of World Religions in Melbourne, Australia (December 3-9) provided another networking opportunity, for those working this angle. Both the Anglican and Catholic churches have been called upon to respectively rescind a 1496 charter, and repeal some papal bulls. These are rather esoteric back office doings. I wouldn't expect to read much in The Oregonian about all this, but maybe in the Metro section some Sunday. Quakers have a long affiliation with Native Americans, even though Pennsylvania was to some extent expropriated or commandeered. Power sharing continued, with Quakers then losing some clout by staying loyal to the "Indians" resisting war taxes to fight their friends. Arthur and I had both read the same Catholic pamphlet on this topic. Arthur also reminisced about Floyd Schmoe, who spent much of his life working on behalf of Japanese families during the internment camps fiasco. Arthur remembered attending Floyd's 100th birthday at the meeting house in Seattle. Floyd had noticed the grass hadn't been cut and was working the lawn mower, making the place look nice for his party. Speaking of Quakers and lives that speak, my mom Carol Urner and I were talking recently, about a productive meeting in Whittier. An Islamic bank in that area, operating by different rules, is doing fine as an institution. There's nothing to keep various types of bank from sharing the same infrastructure, plugging in to the same grids. This idea that it's either/or, when it comes to banking, is bogus. Diversity is what banks themselves preach (as in "diversified portfolio"). We're a packed house tonight. The talk is on Spirituality & Religion. I was thinking it was on the Parliament of World Religions, but that will be another time. Milt has just the one slide. Bill Lightfoot, my uncle, and maritime scholar, is here with me tonight. Milt Markewitz is our presenter. He's somewhat the Jewish mystic, a Qabalist in some ways. Bill and I had a good dinner at Bridgeport Alehouse, catching up on family in Bellingham. I talked about my search for a new line. We agreed that I'd likely do best as some kind of teacher. What school would have me though? We floundered around, sounding a lot like philosophers. Wanderers have some rarefied views. Abraham Lincoln came up a number of times, as our most deeply spiritual president. I am reminded of president Obama's making a connection to that guy (rather deliberately and intelligently I thought, with that bible and all). I was quite vocal, in my one interjection, in identifying Planet Earth with Israel, as in "promised land". Israel is not some little patch of dirt, a few state rooms on the spaceship. That's ridiculous, no? More PR for the PL. No one disagreed. Of course my party line is consistent with the "desovereignization" meme. Buckaneers, like pirates of old, take nation-states with a grain of salt. They come and go don't they? Planet Earth, on the other hand, has a relative immutability about it. Sometimes it pays to look past our superficial differences, especially if we're claiming to some sort of spiritual adeptness. Nationalism is not the highest IQ ism, let's at least be clear on this obvious point. I spent much of the evening gawking at Bill Sheppard's creation: an 8088 assembly language program for looking at medical imagery. He'd been trying to decode these dcm files, in which lossless JPEGs are embedded, but hadn't found the right open source utilities to decode them. We're hearing a lot about the massive federal deficit again. The deficit adds to the debt, which is more massive yet. The exponential interest on these amounts is supposedly the inheritance of future generations, meaning they've been effectively robbed of opportunity even before birth. Not every economist has the same model of the global economy of course. The more realistically minded do remember to credit the sun for supplying our planet with a steady inflow of energy. Calling it "cosmic accounting" makes it sound too hippie or something, but we're really just talking about thermodynamics 101. Planet Earth is not a closed system, and anyone who tells you otherwise needs to do some more homework. That the sun is driving vast energy cycles, which in turn drive a lot of our engineering, really has to be on the books somehow. Earth is like a nonprofit in getting this grant income. Some call it "surfing the solar gradient." Economists with little training in science forget to link wealth creation to natural phenomena, especially extraterrestrial phenomena. A gigantic fusion furnace, bathing the Earth in free power, just doesn't get much notice in these economists' bookkeeping. Out of sight out of mind. We should divide economists into two camps: those giving the sun credit for sponsoring our economy, versus those with no clue. Next time you listen to an economist or read one's analysis, see if you can figure out which pigeon-hole to use.